In the 20 years since this study, an effective organisational culture can only have increased its importance yet seems even harder to achieve. Everyone is aware of how rapidly expectations have changed, how much more is expected of our workforce, how even very large companies must become more agile and flexible. There are far higher levels of uncertainty in so many aspects of an organisation these days, not the least of it is the decreasing tenure of CEOs and other executives. Expectations of our leaders continue to increase, and certainly the number of consultants and courses and books available to help people become better leaders is increasing. And I am reviewing one of these books. While much of the advice available to people who want to be better leaders is prescriptive (“do this” “say this” “behave this way”), a notably different approach is taken with this book. It’s about building leadership skills from the perspective of deep personal growth, building a better understanding of who you are, and taking the time to deal with the issues that are holding you back. The book argues that effective leadership is best achieved through a path of self-exploration, to resolve past hurts and shine light on ingrained habits, to uncover one’s authentic self and learn to be fully conscious in your choices and improve your ability to respond to life’s daily challenges. Climb a Different Ladder brings us to understand that certain deficits in our childhood caused us to interpret the world a certain way, and that we often respond to our current world from that early interpretation in an automatic, reactionary way that can leave little room for appreciating different interpretations and responses. While we all have strengths and limitations inherent in our own worldview, it is the lack of contextual understanding of our automatic reactions and how we fit within the broader community that prevent us from understanding, healing, integrating and then maturing our ability to make better decisions. Walter discusses the three ‘maps’ of the Q12 profiling system that shape how we relate to our world – the relationship map, the action map and the thinking map. Within each map are four quadrants, and the characteristics of each of these quadrants are discussed within the book. As an example, some of these 12 quadrants include Optimist, Pragmatist, Entrepreneur, Motivator, Supporter, Analyst and Idealist. These quadrants are explained in greater detail in a Q12 profile. Each quadrant has inherent strengths and potential limitations, which are likely relevant to you depending on how strongly you inhabit that particular quadrant. The Q12 profiling system also explores the formative experiences that formed those resultant automatic patterns of behaviour and then gives you, most importantly of all, tips and techniques of how to move past these automatic reactions and create a higher awareness, resulting in improved choices in your life. There are four case studies – Tina, Mike, James and Tim – that directly link behaviours borne from childhood deficits to each person’s maps, and then shows how each person moved through increased self understanding to transformation. The road may be difficult (there are no guarantees of quick fixes here), but we see the path each person has taken to achieve a happier and more successful life. Walter writes well and openly, and his points are easy to follow. The introduction to the Q12 profiling system is interesting, straightforward and engaging, and the case studies are well rounded and fascinating. However this isn’t a book in which a couple of nights reading will have you understand everything that’s going on. Your first read will give you the basics – yes, I can see myself reflected here, and this profiling system makes sense – but to fully appreciate the path of personal transformation it may take a couple of readings. The last quarter of the book is where Walter outlines his model for the development of higher consciousness that underpins the Q12 profiling system, revealing his deep understanding of consciousness and the metaphysical, and he introduces concepts such as the transpersonal self and the unitive self. These are the chapters that will need to be read more carefully to be fully appreciated and understood, especially if this is new territory for you. Walter has laid out a straightforward model and roadmap for personal transformation (or ‘enlightenment’) that is echoed across many spiritual and psychological traditions. His model is built on the works of Dr Abraham Maslow, Ken Wilber, Maharishi Mahesh Yogi, Dr Robert Kegan, Dr Brian Hall and Richard Barrett. This work is gold, and it is worth taking the time to understand it. So what does an effective leader look like using this model? Reminiscent of the servant leadership concept, the “transpersonal leader” has a focus on the common good, and will have the necessary skills and commitment to achieve their vision and goals. They tend to have highly facilitative leadership styles and build cultures based on trust, respect, and synergy. Authenticity is key here. Authenticity is a powerful quality of any good leader, and one cannot be an effective, authentic leader without a strong knowledge of oneself. Working in organisational change for over ten years, it has always been clear to me that effective, sustainable organisational change can only occur when leaders exhibit commitment to their vision, personal awareness, and integrity. Otherwise, many employees just won’t believe in them and the culture won’t shift. But wait! This book is not just for leaders! While this book is aimed at aspiring leaders, it is just as valuable for anyone who wants to better navigate the choppy waters of their industry or workplace. So many industries and organisations are undergoing seismic shifts, and many of us are looking for a stability that will be increasingly difficult to find. While understandable, I think it’s time to look elsewhere. When it is so difficult to make sense of the environment in which we are all working, when change is so fast that things never slow down, let alone stabilise, the best investment we can make is to know who we are: our strengths and limitations, understanding how to make the most of any situation that we are presented with, and how to better understand others and learn from the strengths of others. We need to learn to dance on hot coals! 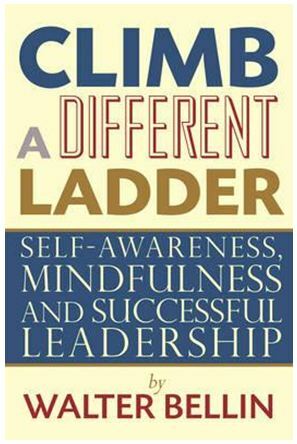 Climb A Different Ladder was released 1 November, 2012. The author Walter Bellin was born and educated in the US and has lived in Australia for some time. He is the CEO of Corporate Crossroads in Sydney. To find out more, you can visit Walter Bellin’s website or mine: Think Act Relate. Lovely post Jude, resonates with me on so many levels.